You’ve written a monster blockbuster series that’s sold millions of books, they’ve all been made into movies and you’re now fabulously wealthy. What do you do next? 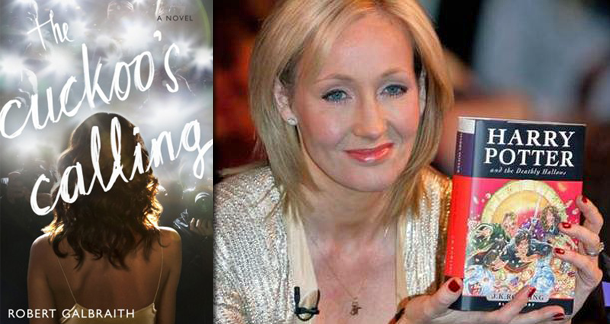 Well, the answer for J.K. Rowling, author of the seven Harry Potter… books, was to write a book under a pseudonym. Just to see how it would do. Born in 1968, Robert Galbraith is married with two sons. After several years with the Royal Military Police, he was attached to the SIB (Special Investigation Branch), the plain-clothes branch of the RMP. He left the military in 2003 and has been working since then in the civilian security industry. The idea for protagonist Cormoran Strike grew directly out of his own experiences and those of his military friends who have returned to the civilian world. ‘Robert Galbraith’ is a pseudonym. The story broke yesterday in The Sunday Times after the novel was thought to be “a bit too accomplished for a debut novel”, which spurred them to investigate where it had come from. Apparently Rowling wasn’t quite ready to tell people about it, either. "I had hoped to keep this secret a little longer because being Robert Galbraith has been such a liberating experience," she said. "It has been wonderful to publish without hype or expectation, and pure pleasure to get feedback under a different name." It hasn’t hurt the book’s sales any, moving it from 4,709 on Amazon’s bestseller list to number 1 – and selling out — after the news broke. I can’t say I blame her for using a different name, particularly after the reception for her last non-Harry Potter book, The Casual Vacancy. Is it going to hurt the series (another Cormoran Strike book’s coming out next year)? I doubt it. Will it get lots of sales on the basis she wrote it? I’d say so, if Casual Vacancy is anything to judge by. I have the opposite problem. Maybe I should start writing under the name Mark Twain, and then eventually reveal that I'm just Nathan Scalia later on. I just finished reading The Casual Vacancy, and loved it! I'm happy to see that this amazing author is continuing to push herself into new creative territory even after her major Harry Potter successes. I'm really interested in checking the book out. I loved the Harry Potter books and now she's writing in my preferred genre, so I think I'll be enjoying it. Author pseudonyms are a time-honored tradition and I think she had just the right reasons to try it out here, and I dig the ridiculous OTT author bio. I don't blame her for doing this. People hold her to impossible standards, mostly the "this isn't Harry Potter" sort. The Casual Vacancy was a good book, but it was a difficult read because the subject is one that most people avoid talking about, at all cost, in real life. Her mysteries within the HP books were always wonderfully written. She is very good at weaving tiny details together, quietly leaving clues, and managing to make the outcome intriguing. This seems like it will be a good fit, and I have a soft spot for mystery books. I'm planning to purchase this one soon, but first I have to do some reading for the AP Lit syllabus I have to teach next year.